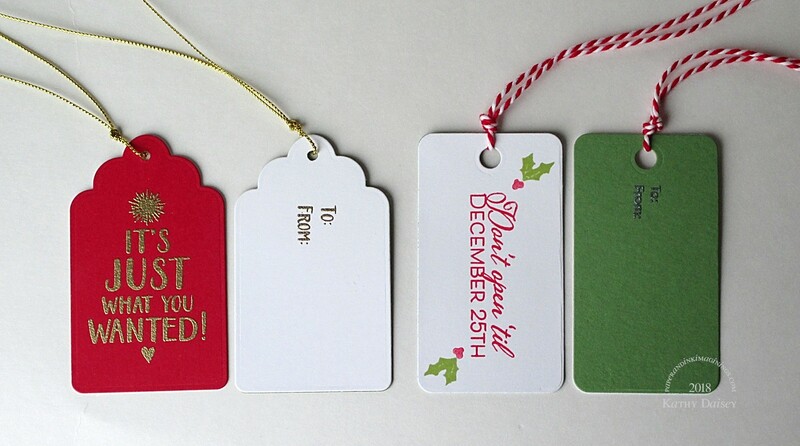 I stumbled upon a Scrapbook.com stamp set of holiday tag greetings over the Black Friday/Cyber Monday weekend. With the discount available, I had to do it! Supplies: Stamps – Scrapbook.com, paper – Neenah Classic Crest Solar White, Stampin’ Up! Old Olive, Real Red, Wild Wasabi, inks – Gina K. Designs Jelly Bean Green, VersaFine Onyx Black, Satin Red, VersaMark, dies – My Favorite Things (rectangular tag), Taylored Expressions (curved top tag), hole punch – Fiskars, embossing powders – Ranger Silver Pearl, Stampendous Detail clear, gold, metallic cord – Paper Mart, twine – Offray. Categories: gift tag, holiday | Tags: My Favorite Things, Neenah, Offray, Scrapbook.com, Stampendous, Stampin' Up!, Tsukineko, VersaFine, VersaMark | Permalink.